The play "Sugawara Denju Tenarai Kagami" was originally written for the puppet theater (Bunraku) and staged for the first time in the 8th lunar month of 1746 in Ôsaka at the Takemotoza. It was adapted for Kabuki the following month and staged for the first time in Kyôto at the Kitagawa no Shibai, produced by Nakamura Kiyosaburô I [casting]. It was also performed for the first time in Edo, at the Ichimuraza, in the 3rd lunar month of 1747 [casting]. This great play is based on the life of Sugawara no Michizane (845~903), a renowned scholar who was promoted up to the prestigious rank of udaijin ("Right Minister", one of the 2 close advisors of the Emperor). Falsely accused by Fujiwara no Shihei, the "Left Minister" (sadaijin), of trying to hatch a plot with Prince Tokiyo to seize the power, Sugawara no Michizane was exiled to Kyûshû. He dedicated his last years in writing poems, expressing both his homesickness and his innocence. After his death, the Emperor's residence was often struck by lightning and people thought it was done by the vengeful spirit of Sugawara no Michizane. A shrine was built in Kyôto to appease the spirit, the Kitano Tenmangû, and Sugawara no Michizane was revered as a the God of calligraphy. In the play Sugawara no Michizane is called Kan Shôjô. "Sugawara Denju Tenarai Kagami" is made up of 5 acts. "Ôuchi" is the opening scene of the first act. Leading ministers and courtiers are in attendance at the imperial palace, where the emperor is resting in an adjacent room due to illness. Prince Tokiyo, the brother of the emperor, is seated in the center, flanked by rival ministers, the ambitious and treasonous Fujiwara no Shihei and the wise and courtly Sugawara no Michizane. Mareyo, Shihei's son, is also with them. An emissary from the Chinese court has come to request a portrait of the emperor. 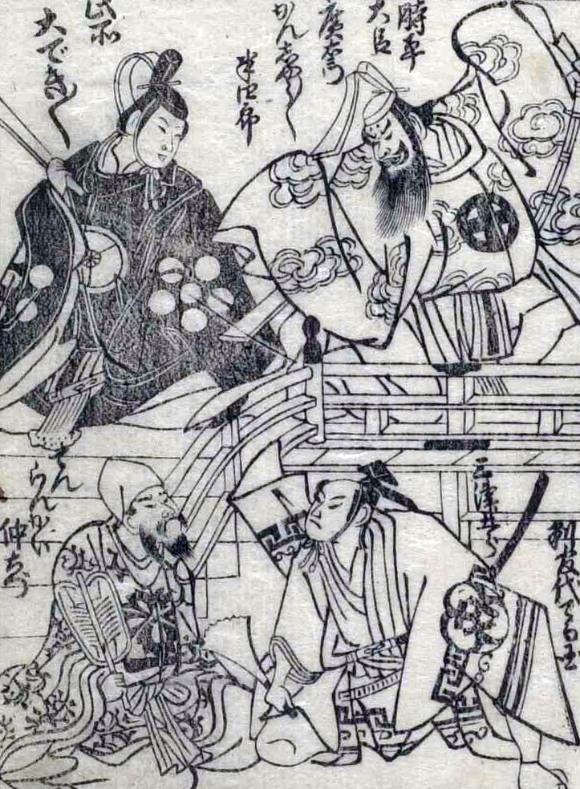 Michizane suggests that the emissary's request be refused due to the emperor's illness, but Shihei argues that such a refusal may cause rumors that the emperor must be crippled and unfit to be seen in public. He announces that he himself will dress in the emperor's garments to pose for the portrait. Michizane proposes that Prince Tokiyo act as the emperor's substitute instead. The emperor himself agrees to the proposition and the artist from China is brought in to do the portrait with Tokiyo dressed as the emperor. After the Chinese emissary and the Chinese artist have departed, Shihei angrily tears the imperial garments off Prince Tokiyo and tries to make off with them himself. Again, Michizane intervenes, warning Shihei that he could be suspected of plotting treason if he were to take away the imperial garments without the emperor's permission. Prince Tokiyo announces that the emperor has requested Michizane, an expert calligraphist, to choose a successor to whom to transmit his art. Shihei's son Mareyo immediately offers himself as candidate, but Michizane puts him off. This rebuff adds to Shihei's resentment against Michizane. After the others have retired, the rival ministers face each other in antagonism. Terukuni Hangan steps in between the two and the three actors strike a mie while the curtain is drawn.